Can a big city girl survive the holidays in her boyfriend’s small hometown? 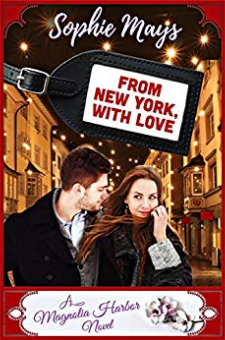 When Emily met Josh while living the high life in New York, she was jolted by his small town disposition and easy-going nature in contrast to the ferocious world that they lived and worked in. When her mother decides to travel abroad for the holidays with a new boyfriend, Josh invites Emily to return home with him to his small hometown of Magnolia Harbor, where love, compassion, and a good joke will always be worth more than making money or wielding power. His childhood bedroom, full of rustic wood and wallpaper is a stark contrast to his slick Manhattan apartment. His huge, affectionate family is a far cry from her jet-setting mom and workaholic father. With the holiday season in full swing, she has to face the fact that they come from very different worlds...maybe too different? Luckily, she knows that when they are back home in New York everything will go right back to normal.But after an unexpected confession from Josh, Emily must suddenly confront whether she's the city girl she has always considered herself, or if maybe, just maybe, there could be a different version of the life she always imagined she would lead.Can the future she dreamed of with Josh be possible if they want two very different things? Or will Emily’s first Christmas in Magnolia Harbor be her last?…If you’re in the mood for a feel good, sweet, holiday romance, then start reading Sophie Mays’ From New York, With Love today!AUTHOR’S NOTE: This is a 20,000-word clean romance with no mature or offensive language. This book is part of a series of standalone stories that all take place in the town of Magnolia Harbor. Sometimes the stories lightly interconnect or cross paths with characters or locations from other books within the series, but you do not need to read the other books, or the books in order, to enjoy them. These are standalone stories, with no cliff-hangers and HEA endings. Enjoy!